Description: This brochure encourages a long-term view of the decision not to adopt. Written in a direct, but kind manner from a Christian point of view. The reasons: I would feel too sad. I’d rather have an abortion. The baby’s father doesn’t like the idea. I hate the foster care system. In my family, you keep the baby; etc. It ends with: no matter the decision, the child is a precious gift that should be valued. This literature answers the question so many undecided birth mothers want to know. I have made a packet that includes this information. Thank you so much! I was SO SUPRISED to discover that so many women abort their own child rather than give them up for adoption!!!! 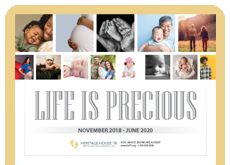 This handy brochure answers the main objections that most women have about adoption and really helps them open up their minds to be able to consider giving life to their child and choosing adoption. This is a must have counseling tool! We use this brochure with our abortion-minded clients and it is well laid out for easy reference. Answers their objections to adoption in a clear easy manner. 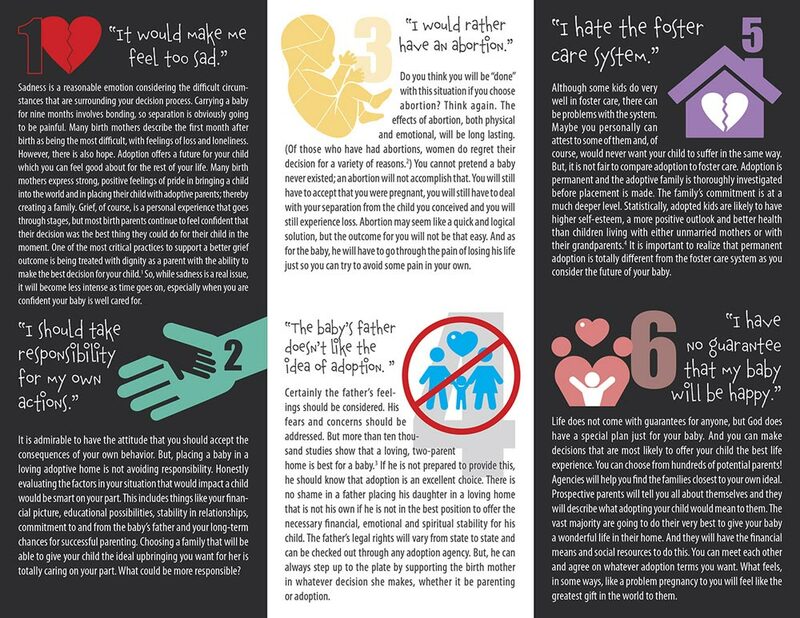 This brochure answers 10 very common arguments our patients pose in disregarding adoption as an option for their personal situation. 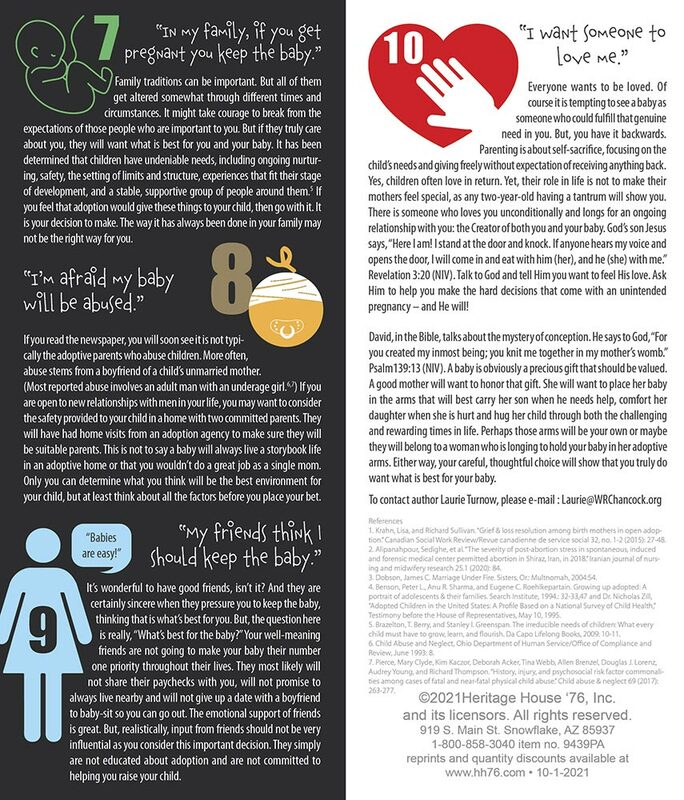 Not only is it good to give to patients, but a great quick-reference for staff and volunteers at your center to know how to respond to common statements against adoption. Adoption is the hardest topic to get clients to discuss & this brochure addresses many of their concerns. It is very useful to our peer counselors in debunking some of the myths that make it so scary. I use this often with abortion minded clients and those who are undecided. It has great responses to common "reasons" that keep girls from even thinking about adoption. The one drawback I have is the response to "I would rather have an abortion" is harshly honest and I would recommend you read it closely before buying.